First Line: When the woman awoke, she was instantly aware of two things. 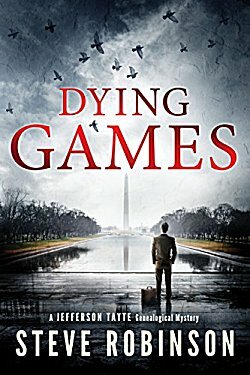 When a string of cruel and elaborate murders strike Washington, DC, they all have two things in common: a family history chart is left at each crime scene, and the victims all have a connection to genealogist Jefferson Tayte. Tayte is called back to DC in order to aid the FBI with solving the crimes, but even though he can crack the killer's clues, he never seems to be able to save the victims. Tayte is wracked with guilt, and his reputation and career are in ruins. With a killer running rings around him, how long will it be before Tayte himself is the next victim? I have to admit that this is the first in Robinson's Jefferson Tayte series with which I've been disappointed, and it all begins with the plot. I was horrified at the game the killer created in which so many innocent people died horrible deaths. Normally when I have strong emotions like this, they transfer to the killer and heighten my desire to see the person brought to justice. But that transference didn't happen with Dying Games, and I'm not quite sure why. The character of Jefferson Tayte himself didn't help matters at all. More than one scene had him losing his temper and behaving foolishly when people's lives were at stake and the clock was ticking. The man has shown in previous books that he knows better. I found myself reading and hoping that Tayte would get his act together. Stop reacting and use his brain to find the actual killer and get ahead of him. Stop playing the killer's game. Unfortunately, it took him forever. He seems to be the type of character who, once he has a happy and fulfilling personal life, starts having trouble keeping his professional life together. By book's end, Tayte experiences a major change in his personal life, and I wish him well. The previous five books in this series are very enjoyable, and I'm wondering what the future holds in store. But you know as well as I-- your mileage may vary!